Nokia has announced the Lumia 920, the next generation of its phones to wear the 'PureView' branding but, despite the name, the camera technology isn't up to the standard of the 808 PureView. Rather than the 808's 41MP, 1/1.2" sensor, the 920 has a conventionally-sized 8.7MP CMOS. Nokia is still making big claims about the 920's camera capabilities, it has a Carl Zeiss-branded lens featuring ‘floating lens technology’ image stabilization, prompting claims of better low-light performance than other smartphones. The Lumia 920 and the co-announced Lumia 820 both run on Microsoft's Windows Phone 8 operating system – an improvement over the Symbian model on the Nokia 808, which we gave our Gold Award to in our July review. The Lumia 920 uses a 8.7MP 1/3"-type sensor (around 5x3.5mm), which is fractionally larger than the image projected by the lens. The camera then uses sub-sets of the sensor area to give either 8MP crops in the standard 4:3 aspect ratio or 7.1MP to give a widescreen 16:9 image. This method means the 16:9 image is larger than if it'd been cropped from a 4:3 sensor. The final images retain the same diagonal angle-of-view, which means the 16:9 crop is wider than the 4:3 one (its horizontal angle of view being more like a 26mm equivalent lens, while the 4:3 crop gives the horizontal angle-of-view of a 28mm equivalent lens). This same technique has been used by several Panasonic cameras, including the DMC-LX7. Espoo, Finland and New York, NY - Nokia today announced the Nokia Lumia 920 and the Nokia Lumia 820, the first devices in Nokia's Windows Phone 8 range. The Nokia Lumia 920 is the flagship Windows Phone 8 smartphone, including the latest advances in Nokia PureView imaging innovation. Using advanced floating lens technology, the camera in the Nokia Lumia 920 is able to take in five times more light than competing smartphones without using flash, making it possible to capture clear, bright pictures and video indoors and at night. It also compensates for hand movement while the photo is being taken. "Nokia PureView continues to deliver cutting-edge technology to make it possible for a smartphone camera to take the kind of images usually only seen on a standalone SLR camera," said Jo Harlow, executive vice president of Nokia Smart Devices. "With the Nokia Lumia 920 we have made it possible to shoot pictures and video at home, outdoors, in a restaurant or even at night, and come out with professional-looking results." "We view imaging as a core area for differentiation in the smartphone space," said Crawford Del Prete, Executive VP WW Products and Chief Research Officer, IDC. "Low light photography has been a weak point for smartphones. Nokia has addressed this with PureView to create real customer value. By applying its rich expertise in imaging Nokia has created a best of breed experience for everyday use." The Nokia Lumia 920 also comes with Nokia City Lens, the latest addition to the Nokia location suite. By pointing the camera at a city street, City Lens overlays information about restaurants, shops, hotels and more on the surfaces of buildings, for the most intuitive way to explore surroundings. Nokia City Lens is the start of a new augmented reality experience that also enhances Nokia Maps, making it possible to move between maps view and augmented reality view to help people check their direction and surroundings. Along with enhancements to Nokia Drive and Nokia Transport, the Nokia location suite of services represents the most comprehensive, integrated mapping experience of any smartphone. The Nokia Lumia 920 also comes with Nokia's largest ever battery (2000mAh) and, for the first time, built-in wireless charging for an easy, convenient way to get more out of every day. The Nokia Lumia 820 is a stylish, mid-range smartphone that delivers high-end performance in a compact package. While the Nokia Lumia 820 has the same unibody look and feel as the high end Lumia smartphones, it comes with an exchangeable shell design. Exchangeable shells not only make it possible to select from a range of colors, but also to add wireless charging. Beneath the shell is room to insert a micro SD memory card. Windows Phone 8 provides a more personal smartphone experience, with a start screen that can be more easily rearranged to reflect individual priorities and new animated Live Tiles for real-time updates on the things that matter most. The ability to sync content between Windows Phone 8 smartphones, Windows 8-based PCs and tablets or Xbox means files, music, pictures and video can be accessed in whichever way is most convenient. With Internet Explorer 10 for faster, safer browsing and Microsoft Office apps built into the platform, Windows Phone 8 is also the easiest way for getting things done. Nokia also announced a range of wireless charging accessories and partnerships. The Fatboy Recharge Pillow provides a fun way to recharge, while JBL introduced the JBL PowerUP, a wireless charging docking station with high quality audio in retro styling. Deals with Virgin Atlantic to put wireless charging stations in the London Heathrow Clubhouse lounge and Coffee Bean & Tea Leaf to put charging plates on tables in some of their cafés, were the first of many deals Nokia intends to sign to take wireless charging outside the home and office. The Nokia Lumia 920 comes in yellow, red, grey, white and black. 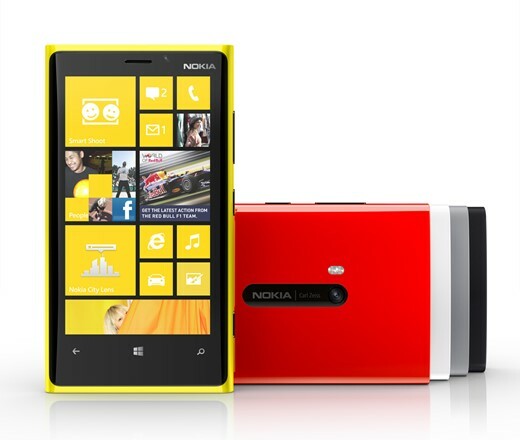 The Nokia Lumia 820 comes in red, yellow, grey, cyan, purple, white and black. Both phones will be available in pentaband LTE and HSPA+ variants and are expected to start shipping in select markets later in the year. Nokia will announce pricing and specific roll-out dates country by country when sales are due to begin. OIS at night withouth xenon is useless if you picture moving objects(=people), ask yourself why Nokia promotes this phone picturing only static objects at night? For a video OIS is good but you can always stabilize it with postprocessing, nowadays even youtube has that option. The Lumia 920 has a nice OIS and claimed amazing low light performance. What they forgot to tell you is that is uses an exposure of 1/3 sec. Lumia 920 Pureview OIS seems to work fine, some test against Samsung. I get back from vocation and what i see is the nokia's trolling pop up parsleys, whining to convince of how superb camera, nokia phones have !!! give us a break ( come on mate show some dignity )!!!!! if you have any ?????? Makes you wonder how often they do this and don't get caught. Shouldn't this be false advertising, like Sketchers? What an silly comment. All product adds are simulations they are there to better express what the product can do. You actually believe the adds on TV? Let me give you a reality check... ALL PRODUCT ADVERTISEMENTS ARE SIMULATIONS!!!! It's pretty easy to find similar simulations used Samsung and Apple ads too. I bet these can be find in camera manufactures ads too. Technology simulated in those ads seems pretty functional in real life with some prototype hardware (as seen in pureview tech site) or in hi-res images published in verge where Lumia 920 seems to beat Nokia 808 and other camera phones. Anyhow I'd prefer some independent tests from dpreview and others - but I have a feeling we will get those too. Perhaps 2013 we can get a 3rd generation pureview camera phone that has all; OIS, lossless zoom and pixel oversampling tech with 41 MB (or similar) BSI sensor. So, it does really make a difference. I can see how they used other products to show the benefit of OIS. It happens all the time, and not just by Nokia. At least in this case, the technology really seems to work. No, I don't believe advertisements.... I just thought that there was supposed to be some sort of accountability to the public through some system, like in Canada here we have the Competition Bureau and Competition Act which makes this illegal. Just don't understand how so many companies can get away with this so blatantly. Was the ad that misleading, if OIS actually works or if used tech gives some advantage in low light conditions? Those performance comparisons seen at verge (http://www.theverge.com/2012/9/7/3299784/nokia-lumia-920-pureview-camera-hi-res-photos) do give me same impression than the ad did give. As the used tech is already seen in larger cameras and we know that it does works, I'd expect it to work also in cameraphones. Still I think we only now that for sure after some independent reviews are made with actual production software/hardware. check out samsung galaxy camera ads if u call nokia's fake. u think this small sensor on samsung produces those group photos shown "live" with such dslr-like blurring of background? It is a shame they didn't add the 41 mega pixel sensor, so I'll wait for the next generation. Think it was/is pretty disappointing that Lumia 800 is not upgradable to Win8, so I'll just wait longer this time until the full monty is delivered from Nokia. PS: I remember visiting Finland in years 99/00. What a proud and serious company it was ! For example, I saw what an impact it had on technical education system in Finland. It is so sad to see it in the hands of characterless lying charlatains nowadays. Yeah.. Pureview must mean ... really crappy Pictures... right? Next time get the facts Before you complain. If Pureview means this kind of quality then this is a brand I will look for in my next phone! The 808 brought so much excitement because of the 1" sensor. People here know, what kind of results one can possibly get from 1/3" sensor. Regardless of OIS. with reagrds to the advert well its a childish mistake but surely we all know that adverts are just nice simulations of what really happens. Surely no one believes the adds on TV. Couple of points. Nokia is wedded to Windows Phone (WP) because Microsoft is giving them over $1 billion dollars to keep them alive in the mean time. The hardware for this Nokia WP 8 rollout (920 & 820) is obviously ready, something else is not & its WP 8. Microsoft still has not released a SDK (software developers kit) for WP 8. For WP 6 and WP 7 they released the SDK many months in advance of the actual launch of the product so developers can make sure their stuff works with the new software (all OS vendors do this, the Apple iOS 6 SDK has been out for months). At this point MS has not released the WP 8 SDK, although rumor has it a "beta" SDK will be released soon. This means WP 8 is way behind and holding Nokia back here. So Nokia signed their life away to a software company that is notoriously late in delivering on their software release targets for operating systems - which is bad when the fate of your company hangs in the balance. Going all WP isn't looking so good now. "Nokia is wedded to Windows Phone (WP) because Microsoft is giving them over $1 billion dollars to keep them alive in the mean time." I see. In that case, I can forget about reading anything about any Nokia phones from now on, since it is going to be Windows and no Android. Thanks, for saving my time. We have suffered enough from Windows for PCs through the years, bugs, incessant patches, security issues, bloated software, anti-competition behaviour, ... But we had no choice given its dominance, but no, not with phones! It is too scary if this company is allowed to dominate even more. the real threat is not microsoft. That is the bogey man the industry been preaching for some years now that is no longer relevant. The real threat now is google. now MS. google owns ur daily search, ur blogs, ur data, mails, ads and now ur phones. Sasparilla, just to make you aware the Windows Phone 8 SDK was leaked on July 26th. (Sasparilla) Thank you for the explanation. I thought as much with regards to windows being responsible for the lack of information on pricing and availability of the Nokias. I did not know that Nokia had signed such a stupid one sided agreement. Windows is letting other manufacturers use their OS. So why shouldnt Nokia use other OS? someone made a bad deal! If indeed windows phone OS is delaying the Nokias Im affraid that they have lost the boat and Nokia goes down the drain. It also goes towards the theory that Elop is a microsoft plant. No idiot would sign away such a one sided deal unless they have an agenda. Nokia could have done what the other manufacturers are doing, using windows phone, android and their own OS. Im sure it would have survived if it had. As it stands Im not so sure anymore, real shame, sad day for Nokia fans. A bit disappointed: The whole point of the "original" PureView is that you could do a good bit of zooming and still get a nice shot out of it while maintaining good detail. This version of ProView isn't going to allow for that at all - really, they're just promoting it's lower light capabilities, which is ok, but nowhere near what was expected by some. Image stabilization is fine, but the micro-springs they claim are being used for the lens system? Considering how often some people drop their cell phones, I wonder how long those things will last before breaking? I have high hopes for the Windows OS. I've played with a Win phone recently and in all honestly, they are nice to use. Smooth screen flow, and very intuitive, with very good voice recognition accuracy. The only true barrier in their way are the lack of "non-major" apps. You can find all of the major apps, but if you want your local news station app for example, most likely it's not available yet. Maybe in time. "The whole point of the "original" PureView is that you could do a good bit of zooming and still get a nice shot out of it while maintaining good detail." Are you working on Nokia? Because they never said that. Just a couple of Days ago they twittered that Pureview is about using multiple technologies to get the best possible Pictures. But I guess you know better. Could you please give us a link to Nokia which agrees with your statement? BrunoH, are you working for Nokia? All your comments are on articles containing Nokia. And your defending it like no other lol. At least the new OS will save us from the 41mp barking and the popping up parsleys. They do that oftenly !!!!! Not really a news. All companies do that constantly. Don't fool yourself thinking it's different anywhere else. Well, I might have hoped Nokia were an honest company. Or at least intelligent enough to want not to create negative publicity around their key product launch. All they have achieved here is to place themseves shoulder to shoulder with the others in the gutter, whilst simultaneously telling a watching world that their product can not of itself deliver the results they claim. Genius. Is it possible that add is missleading. I tought every add i see is the truth and nothing but a truth. Models in magazines are real... photoshop not used. You think is samsung or apple makes an add from video "shooted" with S3 or iphone, you think they are realy doing this? And what do you think if Nokia would actually have shooted that video with mobile how crappy would have that looked compared to competitors videos. This is just a fail of some advertising agency nokia is using, nothing more. "This entire footage was shot purely by Lumia 920"
Everyone, please see this video! Is it using illumination combined with slow exposure time to get the image? Please confirm in the comments section of the video. No it did not use flash! The flash only lit up to get a god measure of the distance for focus, thats all!. In the video you can clearly se when the Picture is taken (after the two flash illuminations) and at that Point the flash was not used. Maybe the "focusing flashes" is a slow sync flash. Why not turn it all off since the iphone and the gs3 doesn't have the focusing flash in that vid. PS: BrunoH, are you working for Nokia? All your comments are on articles containing Nokia. And your defending it like no other lol. Whats with all the Symbian hate? Its a good operating system for a phone that prioritises phone functions over "apps" and whatever else. Windows Mobile is a horrible operating system and everyone I know that uses it wants to get rid of it as soon as possible. I'm very glad that with Nokia adopting winmo a decision was made to keep the Symbian operating system in some devices. Without it, I'd go elsewhere. I think you actually have no idea what you're talking about. Windows Mobile OS was replaced by Windows Phone OS two years ago. Windows Phone 8 that powers the Nokia Lumia 920 is currently the most advanced and most user friendly phone OS. I stand corrected, and especially sorry for getting the name of an operating system that I don't like and don't use wrong. Actually, Thorbard was pretty close to the mark. Windows Mobile and Windows Phone 7 were both based on the Windows CE kernel. Windows Phone 8 is actually based on the Windows NT kernel, meaning WP7 is more closely related to Windows Mobile than it is to WP8. "Windows Phone 8 is actually based on the Windows NT kernel, meaning WP7 is more closely related to Windows Mobile than it is to WP8." Could you please explain in what way? Which kernel it runs on does not affect the user interface. NT kernel only gives programmers more features to use, and makes porting from windows 8 a lot easier. But the user interface is the same. Lumia Design is like Mixing of Ipod body and iphone(rounded rectangle front ! if anyone can notice ).Clever Nokia! NO PUREVIEW! But Still, the feature promised are still amazing! Sorry. But you're completely wrong and even Apples lawyers can confirm that. Apple attorney Harold McElhinny held up one of the Windows Phone-based devices from Nokia (it's unknown exactly which model was shown) and told the jury, "Not every smartphone needs to look like an iPhone." I think that the LUMIA design is pretty distinctive, it doesn't resemble Iphone or Ipod in any way. We can say that NOKIA did wrong marketing decisions but in terms of build quality and innovative desing they are ahead every single smartphone producer. Yep, I agree, its completely unique and i hope that nokia will bring a plethora of other design icons like when in the era of keypad phones. Back then Each phones could be identified from afar just by looking. Now You will have to guess if its iphone and then only if some other androids. Lumia and These N8 like designs still stand out and they are beautiful and bold. One thing If you take a silhouette of Lumia 920 ..Its a Perfect rectangle!! Now another reason Apple can't sue Nokia once it feels threatened. Based in the photos above I'd say it's a stretched ipod nano 6th gen. with no clip on the back. Pretty hard to be original these days when you have to design around a 4+" rectangle screen on a roughly 5" rectangle device made as thin as possible. I think there is a very great deal of disappointment around the lack of lossless zoom in the 920 : this is Nokia's key to defeating the likes of the Galaxy camera approach when (NOT "if") phone capapbility is added by Samsung (& sooner or later others). Come on, Nokia, get a move on ! Edit my previous post recommanding the video where a man and a woman were biking... IT'S FAKE! It's not taken with Lumia 920's pureview camera, but a giant DSLR!!! BUT it has PUREVIEW all over it???!!! Shame on you Elop!!! Are you afraid that Nokia is not dead enough??? Had Nokia be in the hand of a Finn it wouldn't have happened!!! At the end of the video it saids: "THIS IS LUMIA"
The direct implication in the video was that you were seeing video from the Lumia 920 in stabilized and non stabilized form. This is why Nokia has now had to publicly announce an apology - not what they needed at this point. Just because others have done something doesn't make it okay. Nokia just got caught because of sloppy shooting where a reflection showed what was going on. Promotional videos are like that! No worries.Its just that the video stopped at the wrong time due to buffering and someone took notice of Camera Crew. No product yet has the quality to bring a professional image able to be broadcasted for a inspirational product AD campaign. It may not be worth the risk to be true. See for examples the ADs and Brochures for a Point And Shoots... The pictures and videos taken for them are Heavily Photoshopped - Post processed from a professional Camera. All that to make potential user believe. A van is clearly seen at the 0:27 mark, not a man riding on bicycle. So disrespectful that Nokia is treating web surfers as morons. Nice catch there. Yet, that's what advertising companies do, they don't use the product itself. If only they had hired me, it would have cost way cheaper and at least it would have been done with a Nokia device from a bicycle. I take pictures / video's while driving my bicycle all the time. But no, they had the advertisement budget to cheat the sheeple and so they did. Don't know what you're talking about. Did they ever mention this video was taken by Nokia Lumia? They never did. Also commercials for Nikon were made on Canon cameras but thats what the production houses use. I see no problem with that. And if you check the description below the video; which many people never do; it clearly says: The video demonstrates the benefits of optical image stabilization only and the video is not shot on a Lumia 920. But they did even mention that it isn't ? Or just to demonstrate how OIS works ? No. People including me wow'd on that ad, believing that Pureview can achieve that kind of stabilization. Then a few hours later, the truth surfaces. I don't think I'll believe on the last video they uploaded. Lying or deliberate misleading is both morally and politically wrong, it's still wrong even if everybody else is doing it. This ad is apparently demostrating the effects of the Lumia's OIS ability. Nikon ads shot by Canon equipment is an entirely different thing, they are just showing people running around with Nikons, but not the abilities of the cameras. Plus, why would anyone watch the Nokia ad to know how well non-Nokia OIS systems work?! O...BTW..this description was not there at the time I was watching it. They knew they screwed up. 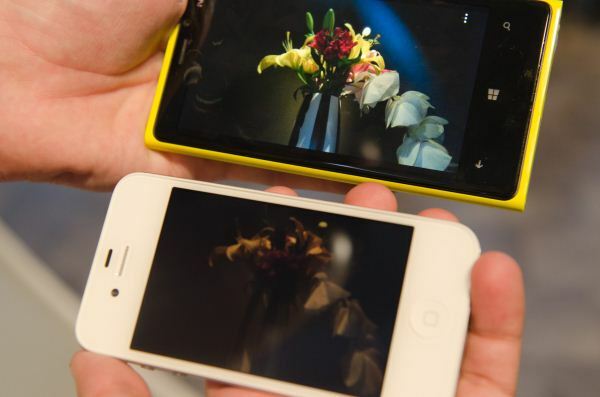 "The video demonstrates the benefits of optical image stabilization only and the video is not shot on a Lumia 920." if you want to "demonstrate the benefits" then why simulate them on a different device? Surely it would be simpler all round just to demonstrate reality, rather than simulating it? A 'simulation' is pointless - the whole point is to know what the device is question can do itself, not whether the desired effect can be simulated by another device. Point is that the OIS was not quite ready (my wild guess) AND also that others like Samsung are careful to always state "simulated"
I read thru a lot of tech site and seems this phone is well received. the stock price does not mean anything, for those investors who bought it below US2, they can just sell to make some money and will surely buy back again. As for no 41MP sensor, i don't think we need to worry, if you are jumping ship to lumia / wp8. as nokia mentioned, it's the 2nd phase of pureview. I am not sure will there be another phase, as nokia still hv other patent, technology in camera, if it did, the last phase will be the dead of most P&S camera. when u are in camera industry for too long, you tend to not be able to think out of the box, the most they can think, is pixel, zoom, lens. Why would they not include the "real" pureview sensor? Seems like a huge mistake in my opinion. Because that would make the phone fatter! And in our time most people want very thin phones! Lets wait and see some image samples! It may be as good as they claim it to be!... certainly better than what the competition currently has to offer! Its expense. The Nokia 808 sensor is huge and expensive, but the guts of the 808 needed for the Symbian OS is very low powered (and most importantly cheap) as Symbian is very efficient. I was in the same boat as oohaah when the 920 was announced; I was disappointed that it would not have the 1/1.2" sensor of the 808. However, I've come to the opinion that this was actually a smart technical move by nokia that was just handled badly in PR. The 920 tackles a completely different problem than the 808 - low light handholdability. For the vast majority of users, being able to take sharp shots in indoors and in low light is a bigger problem than being able to outresolve a D800. And from a low light perspective, the 920 certainly sounds very promising. Compared to a 808, the 920 sensor has 2.3 stops less light gathering area on the sensor, but the lens is 0.5 stops faster, and the OIS should manage at least 2 stops extra handholdability, so it comes out as a wash at worst for low light shots (as long as you have a static subject). All in a package significantly smaller than an 808. I think nokia invented the right product but failed to convince its users. Microsoft will spend every dime it has to penetrate the mobile device market. I agree, they have no choice and have shown with the game console market, if they want a market they will throw away huge amounts of money for close to a decade to achieve it - mobile and tablets are way more important (for future growth and stock price) than consoles ever were. I like Nokia's camera technology and am one of those who aren't worried about many apps. What I will want when my phone plan changes next year is better battery life. I am leaning to the Nokia phone tech, but I think the Samsung battery life rocks unless this improves on that. Be nice to have best of both worlds. Nokia is making a big mistake by betting on Windows and ignoring Android. This blinkered approach and high risk strategy is completely due its current CEO Stephen Elop who is an ex-Microsoft employee..
Nokia is fail and deceptive without the real magic! Windows Phone as a platform has fewer handsets so there is less competition compared to Android. Reason good enough, that. I’m not sharing the same opinion with you. We really don’t need another Android producer. The only Android producer that has a profit is Samsung. All the rest; HTC, LG, Sony, etc. and others are in deep profit loss. The best move they made was go WP8. Look at Sony. they just closed their plants in Sweden and kicked a lot of people. Android didn't help them why should it help Nokia? of music and apps, I wish Nokia and MicroSoft succeed. Let's have something different. The world needs diversity. HELSINKI/NEW YORK, Sept 5 (Reuters) - Nokia (NOK1V.HE) and Microsoft Corp (MSFT.O) took the wraps off their most powerful smartphone on Wednesday, but the new Lumia failed to impress investors, and shares of Nokia, which once dominated the cellphone market, plummeted 13 percent. This isn't too surprising. They announced these great new WP 8 phones and then won't say when they are shipping or how much they'll cost till they announce those details in the 4th quarter (implying a limited and late rollout in the final month(s) of 2012). I.E. they are going to miss a lot of the end of year sales potential. This also has the effect of killing off sales of their existing Windows Phones (WP 7) which can't be upgraded to WP 8 of the new phones (who wants one of those WP 7's now?). The takeaway of that is that the next quarter is going to seriously blow. Nokia and its CEO did the something very similar before, when they announced they were killing off their existing OS's (immediately killing developer focus) when their first (dead end it turned out) WP7 phones wouldn't land for more than a year. Remarkably consistent missteps that could have been avoided. Nokia keeps going down fast. The main reason is its choice of OS. First it stuck to Symbian for way too long, and then it made another mistake by switching to Windows, instead of Android. And now, it is sticking to Windows, and again failing to see its mistake for way too long. I do admire its determination and perseverence, but unfortunately to the rest of the world, to the consumers, that is called stubborness. People want Android, if not Apple iOS. And Android is picking up and taking more and more from Apple all the time. What a waste of the fine hardware and build quality and other innovation! It's too bad so many people have been blinded by anti-Microsoft bias: WP is far and away more innovative and user-friendly than Android. Yes, yes, there are fewer apps, and the hardware is just now catching up to Android's top spec... but what's the real difference between 100k apps and 500k apps? And so far, the hardware hasn't needed to be faster. WP7 runs smooth as butter. Android, schmandroid. Let's have something new. Why this fixation on Android? Android? Take this as an illustration. The former Nokia CEO once said that "using Android is like peeing in your pants for warmth". I couldn't agree more at the time. Interestingly the above article also refers to an article about the profitable HTC as the counter example by picturing Android as way to success. See where the is HTC now with their short lived Windows and Android strategy. I am using WP7. I bet WP8 will rock the world. "People want Android, if not Apple iOS." That, sir, is a complete lie! My neighbours friends saw my wifes White Lumia 800. They just loved the look and feel of it. Just by holding it they went and bought one themself. Get real here. Ordinary people know about iPhone, Sony, Nokia, HTC as brands. They dont have the faintest idea what kind of OS they run. As long as the phone can make calls, show emails and access facebook ordinary people are content.
" Not only does this method mean the 16:9 image is larger than if it'd been cropped from a 4:3 sensor, it also means the camera retains its 28mm equivalent field-of-view, regardless of which aspect ratio you shoot in." When I start framing my images diagonally, I'll accept this interpretation. Until then, horizontal field of view, not diagonal, is what I'll use. I agree, that was a great solution for the IS mounting. Shame, they should use 1" and 10 mpix. And let Zeiss figure out compact zoom lens.. That could be interesting. Or follow and improve 808..
Good old days are coming back for Nokia, carry on. Nokia has to be the dumbest run smartphone company on the planet. They are bleeding red ink like a fire hose yet they don't want to take advantage of their 808 camera. I had hoped for a True Pureview à la 808, but I think they have not managed to bring the technology into the WP with the Qualcomm chip. I don't believe it's a case of bad will, just lack of time and resources. I had expected perhaps a 21mp version, which is what this platform can take. The 808 is for enthusisasts - this will do battle with the iphone, teh samsung galaxy, the HTC One X, etc. My next phone will be a 920. I think the big problem with the 808 was the fact that the Symbian OS required very cheap "guts" to run smoothly (single processor, low RAM and on and on). WP 8 phones require certain processors and supporting chips (i.e. guts) that Microsoft specifies and is much more expensive compared to what Symbian needed. Too bad Nokia doesn't offer an Android version, rather than putting all their eggs into the Windows Phone 8 basket. WP8 might be a perfectly fine OS, but many people will still prefer to stick with Android, so they won't buy this phone. Having Nokia exclusively be a Windows Phone house might be good for Microsoft, but it's not good for Nokia. I moved from Android 4.0 to Window Phone 7.5 with Lumia 900 for now. I think WP is much better than Android. It's very fast, responsive, and well organized ..allow me to quickly access to everything just by one hand. I predict WP will replace Android position within 1-2 years. ...And I predict that OS X will replace Windows position in 1-2 years...not! Android had about 3-4% market share in smartphones in 2009. In 2010, it had about 35%. In 2011, about 47%. This year, it is already at 68% (Q2). With these kind of numbers, all others can aim for is to be allowed to co-exist. I think Android's market success is in large measure due to it being the only viable contender to Apple iOS. So for anybody who would not entertain an Apple product, maybe for cost or ideological reasons, or simply they don't like the look/size/features/whatever of the iPhone, then Android has been the only 'mainstream' alternative. And they have all the choice of handsets; different sizes, form factors, ruggedness, price points, etc. That is how I ended up buying a Galaxy Note - I wanted as big a screen as possible, Apple is just not my thing and they don't do a large screen anyway - where else could I look other than Android? But next time WP8/Nokia will be firmly on my radar. And a decent camera would be important. 68% will be no protection for Android - in 24 months almost all of those 68% will have changed their phone. Only DPR fans seem impressed. Nokia stock down 16% today after the announcement. IOW, a big yawn. Well, in stocks "hopes" are bought by all, and "realities" for sell. I believe that announced bad sales of earlier WP phones caused most of the drop as it started even before new phones where introduced. Over at 24/7 Wall St., they're saying that the market saw this announcement as basically, "The new iPhone is about to be announced, but we want everyone to know that we're going to have a new phone coming out, too... well, sometime, we don't know when... at some price, we don't know how much." The market was inferring that Nokia is showing no confidence in its ability to deliver these phones in the near future, if at all, much less at a marketable price. Nokia also killed off sales of its existing WP 7 phones (which can't be upgraded to WP 8) with this announcement as well, as who would want a WP 7 phone now. Maybe at Photokina? Nokia has stand there. Maybe today announcement was for people who do not see difference between 1/1.2 and 1/3 sensor sizes. Maybe there is a link: Nokia->MS->Facebook->Instagram. Nokia without 808 PureView @ Windows Phone is basically dead. I saw the test here, I'm ready for throwing away GF1 for WP with real PureView. It would be total winner for street photography - no one pays attention for someone with a phone. A WP 8 808 would be way too expensive (think $899 instead of $699) and big (bigger than the 808) as the guts needed to power WP 8 (by MS requirements) are seriously more expensive and power hungry than what the 808 needed for Symbian (which was a very efficient OS, however much it was maligned). Give it a few years and, if Nokia is still around, we should be able to get a WP 808. Maybe something in between sooner if Nokia wants to spend the money to develop it. That said Nokia could have easily gone for a larger sensor (like their old N8) than standard cell phone cameras, which is dissapointing (probably size and expense again though). WP license means 5-10% of the price goes to MS on the phone which could have gone to a better camera. Is DPReview about to run al the news in smartphoneland from now on? Please, there are enough CNET and Engadget like sites. Don't drift away from photography. There enough allround sites in stead of specialist sites. I'm happy that DPreview functions as a kind of information filter. Don't make the holes in that filter too big please. I can imagine that DPreview did run a story about the Nokia 808 because it's 41mp cameraphone is a never done before. But this is just a (nice but) regular product development. Please, stay focused on photography. That's because the Lumia 920 carries the "Pureview" brand. If you read the article, you will see the author wishes the 920 has same sensor as 808. Having said that, optical IS on a cell phone is still something to write about. We can't avoid the fact that the world is converging. To many people, the cell phone is their ultra compact. So as long as it has good photo/video features, it should be on DPR. The reality is that phones are becoming a bigger part of photography than ever. And when you have a phone like the Lumia that is touting its photographic specs, I don't think there's anything wrong with giving it a mention in the news section. Besides, if a news item doesn't interest you, just ignore it and move on to the next news item. Besides, from a business perspective, it makes sense that dpreview would want to be a on-stop shop for all news related to digital photography, rather than saying "go to CNET or Engadget". Motorola's new cameras didn't get any coverage because photographically-speaking, they were not very interesting. Nokia's implementation of optical IS in a cellphone is a first and newsworthy. @Richard Shih. In that case you're right. Didn't read it in detail. sorry. If that conspiracy theory were true, we'd have covered the Droid 'phones launched today. Amazon sells a lot of things. Nobody from outside the dpreview editorial team had anything to do with the decision to publish this story. Overall, seems like a pretty good smartphone. Always thought Microsoft's tile interface to be a very innovative and interesting development. Certainly different from anything else out there. But I still really like Apple products, but if I ever switched it would be to this platform, seems promising. It's okay to chase phones because today they have good cams and "filters" in them but the Android side is driven primarily by gaming and tablets and only peripherally by cams. I am not excited by business' spend-money-spend data overlays of this Nokia and would rather see a phone/tablet that connects me Skype-like from a wifi hotspot. Constantly recording the imagery using your phone/tablet might also be a nice app for a night on town or as a security device hanging around the kid's neck. In all its the apps that drive new tech. In this case the term Pureview is merely used to provide feature completeness to the MS Nokia phones. Too bad, I was hoping it would distinguish a new line of camera's (that can also make calls). Somehow this marketing move shows how far away we are from a Windows Phone Nokia with the set of technology formerly known as Pureview. Other than that, the 930 nice hardware for a phone. The N9 should have had this display to make it the eternal Nokia classic. I agree with the "marketing move" reference. However I've seen somewhere it'll take a year or so to port the True Pureview tech. They will not leave it behind, but have to come out with other stuff in the meantime. "JBL introduced the JBL PowerUP, a wireless charging docking station with high quality audio in retro styling"
Does not look retro to me, just a cheap plastic POS. "Deals with Virgin Atlantic to put wireless charging stations in the London Heathrow Clubhouse lounge and Coffee Bean & Tea Leaf to put charging plates on tables in some of their cafés"
For HONOR and GLORY, that's why! F/2, 1/3" sensor, IS. #SOLD. The sensor being that small is rather disappointing, but the F number and IS are very enticing details, I look forward to real reviews to see how it performs. well, I suppose it's one of the largest, if not the largest sensor you can put into a smartphone that doesn't have any part sticking out of it :) So for me it's a win-win phone! Nokia builds good quality, long lasting phones. I know, I had a few of them! If only Win 8 proves to be as good as promised is should be a strong competitor. Funny how Nokia always used to have the best mobile phone cameras, from the first camera phone right upto and including the 41 MP monster camera of the PureView 808. And how ever since Nokia started running the Microsoft operating system their cameras have regressed because the operating system seems incapable of handling esotheric and modern hardware like good cameras and QWERTY keyboards. Actually, strike the word "Funny". "Tragic" is closer to home. After all, the original PureView camera unit was designed only a few hundred meters from where I work, and it's so sad seeing how Elop destroyed that superb product and product line by refusing to sell and support it. Just to continue: without Elop and Nokia Board's new shining strategy, we would have new models that could properly do text messaging, which just happens to be the second most used mobile device function right after telephone calls. You do know that Windows Phone 8 is using the same kernel as Windows 8 RT? Meaning that the kernel is more than powerful enough to handle anything Nokia can throw at it. They've stated it themselves, software is no limiting factor for them using any Pureview technology. And it's certainly no limiting factor for any kind of keyboard, unless you imagine that you can't use Windows 8 RT without a keyboard? In fact, it never was, as the Windows CE kernel was more than capable of supporting keyboards. The thing is, a expensive 1/1.21" sensor takes *a lot* of space, meaning that it's by default not a mainstream solution. @Henrik, how about we wait and see? The article is almost one year old, and while written in rant mode it's pretty prophetic: since then things have only gotten worse. Which is a pity because Nokia surely was a proud thing. I meant let's wait and see how the 920 stacks up. If it's as great as I am expecting it to be, then your criticism is baseless, and Elop took the right route (even though it might have been a detour) all along. Except that the comparison video is fake, or at least misleading. In the video of the bicycling girl, don't they make it look like the "OIS ON" video is taken by the bicycling guy? Well, it's not. At 26-27 seconds, you can see in a trailer window a reflection of the _actual_ setup that has been used for the "OIS ON" setup. The shots are _not_ handheld. The camera is rigged on a van. Also, the night still pictures are similarly forged. In the video, the girl moves all the time, but somehow she is still pixel sharp in images where you can see from the blurred cars that exposure time must be between 1/4 to 1 second. When they marketed the Symbian 808, its camera technology was so good that they could actually let engineers tell the truth, and everyone was deeply impressed. With the new Lumia they have to resort to sad lies... I mean "normal marketing". All the commercials featuring IS are fake! Don't fool yourself with thinking it's otherwise. they say the entire "optical assembly" moves under OIS, rather than just a lens element within. That sounds like the whole camera unit is sort-of gimballed in the phone housing. The results certainly look impressive (except for the whole van thing at 0.27). When will DPR get one to review? Found out why today....Microsoft is way behind where they should be with the Windows Phone 8 software - they have not released the SDK for WP 8 yet (something they normally do 3 or more months before the actual release of the OS version so developers can make sure their software works with the new release). This is a sign that WP 8 is way behind for a release where vendors could sell hardware for the Christmas quarter. So Nokia has hardware ready (hope for their sake its not stacking up in wharehouses for the xmas season, but they were probably counting on being able to sell at this point), but the software from Microsoft isn't close to where it should be. Since Nokia's CEO choose a Microsoft only OS strategy, they are stuck watching the money just bleed away - after this announcement, who will want to buy a Nokia WP7 phone that can't be updated to v8...bad situation for them.